Bentley Yoder is doing well, thanks to doctors at Boston Children's Hospital. When Bentley Yoder was born, his parents arrived at the hospital with nothing but an outfit to bury him in. After all, Sierra and Dustin Yoder said, they had been told for months their son would not live long after birth. In fact, they said doctors were shocked he made it to birth at all. 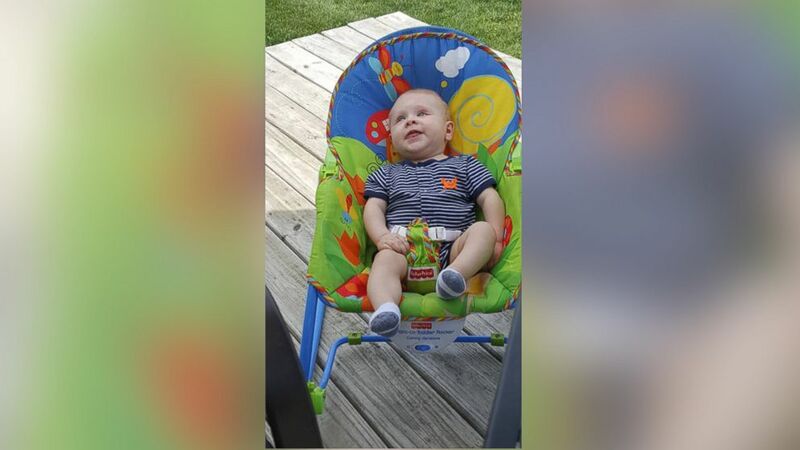 Sierra Yoder told ABC News that Bentley was diagnosed in utero with encephalocele, a neural tube defect that keeps the skull from fully closing and, as a result, leaves the brain protruding from the head. "It was a very dark time," she said. "There was no hope he would survive." But survive he did. Though she had not dared to hope — and in fact she said she had scheduled an abortion at the advice of doctors and then changed her mind — Bentley being a survivor was something she felt all along. (Katherine C. Cohen/Boston Children's Hospital) Bentley and his parents meet with Dr. John Meara, Plastic Surgeon-in-Chief, Boston Children's Hospital. "They [the doctors] would tell me that when I felt him moving inside, it wasn't real," Yoder said. "That it was just twitching. But that didn't sit right with me. I pushed, he pushed back. I played music, he would flutter." 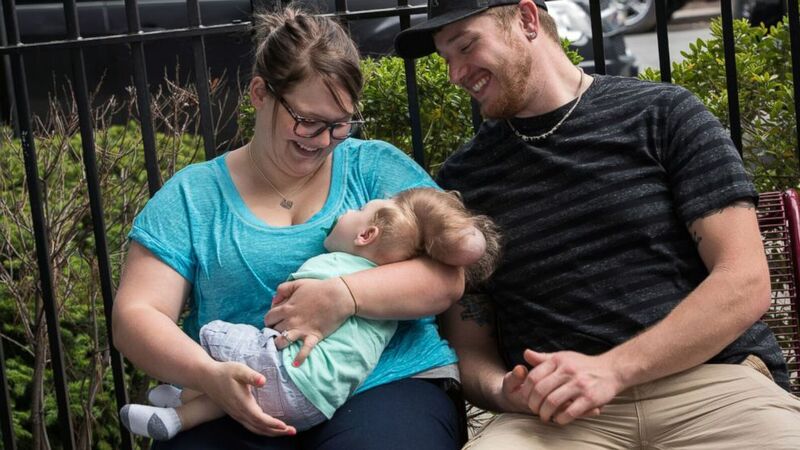 Since Yoder was in no danger and Bentley had a normal heartbeat, the Tuscarawas, Ohio, couple decided to push through but braced themselves to say goodbye. They prepared their 3-year-old son, Beau, to do the same. (Katherine C. Cohen/Boston Children's Hospital) Bentley with his mom and dad, prior to surgery. Bentley was born and handed to his parents. After about 10 minutes, the couple tried to bottle-feed him. It worked. Three days later, they left the hospital with him. "I was scared to sleep," his mom said, thinking he would die at any moment. But a week later, when Bentley was still alive — and thriving — the Yoders decided to seek out another opinion. Trips to hospitals in Columbus and Cleveland didn't give the Yoders what they were looking for. Typical procedure in an encephalocele case is to cut off the part of the brain outside of the skull and then close the skull. Frequently the brain tissue growing outside the head is nonfunctional. But in Bentley's case, it seemed that he was using what was up there. 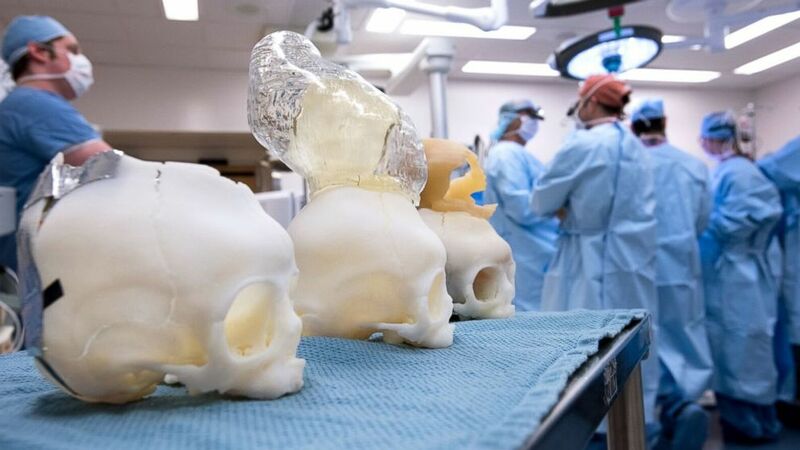 They were referred to Boston Children's Hospital, where Dr. John Meara, the plastic-surgeon-in-chief, and Dr. Mark Proctor, the interim neurosurgeon-in-chief, regularly treat extremely complex encephalocele cases. (Katherine C. Cohen/Boston Children's Hospital) Boston Children's doctors were able to do a mock surgery on the 3D model of Bentley's brain prior to the actual surgery. "We wanted to give him a chance," Yoder said. "He was slowly meeting milestones." Though Meara and Proctor are renowned experts in their fields, Bentley's case was still "severe," Proctor told ABC News. "But we did not want to make the assumption the brain tissue was non-functional." Surgery had to be done to prevent rupture or infection. So they had one thing they could do: Put Bentley's brain back in his skull. In order to prepare, they used a 3D model of his brain and outside tissue. 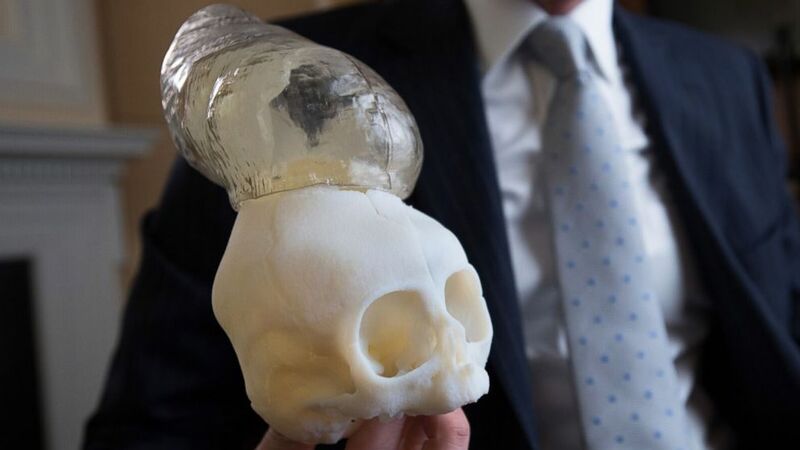 (Katherine C. Cohen/Boston Children's Hospital) A 3D model of Bentley's brain and encephalocele. "Bentley was a unique case," Proctor said. Meara said having the model was "huge," allowing him to perform mock surgery to prepare for the big day. "I then sent it back to the simulation lab where it was analyzed. I was able to know how much brain volume I added back and then make adjustments prior to surgery, rather than having to make those decisions in the OR." "Except for one small sliver, we were able to return it [the brain tissue] to the cranium," said Proctor. Bentley will live, that much is certain, he said. It has been nearly a month since Bentley's surgery, and he is, by all accounts, doing well. "If he smiled any bigger, it would probably cover his whole face," his mother said. He's grabbing at things and holding on to his mom's hand. He's mimicking sounds, she said. (Sierra Yoder) Bentley, three weeks post surgery. "Doctors are amazing," Yoder said, "but some of them don't know what they are talking about," referring to the many medical professionals who, she said, told her Bentley's condition was incompatible with life. "As a mother, you have to trust your gut. If I didn't, I wouldn't have my son right now." But she has nothing but praise for Meara and Proctor. "How do you say thank you to someone for saving your child's life?" she wondered.